Gary Noble Show: Have you heard the Sound Skulptor CP5176? Have you heard the Sound Skulptor CP5176? 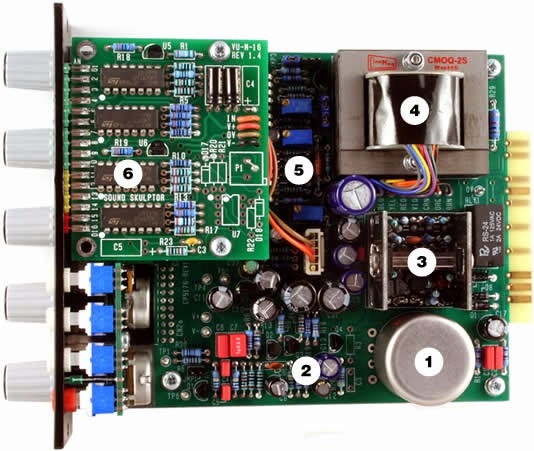 Sound Skulptor is a French based audio manufacturer that specializes in high quality D.I.Y. You can read my post on the Urei 1176 here. 1 Input Potentiometer that sets the signal level before compression. It defines the compression threshold. 2 Out Potentiometer that set the signal level after compression (make up gain). 3 Ratio Rotary switch that sets the compression ratio from 2 to 20. Ratio 2, allowing more subtle compressions, has been added to the original circuit. The SLAM mode is the "all buttons pressed" on the 1176. 4 Attck Potentiometer that sets the attack time: The delay before the compressor starts reducing gain. 5 Rel Potentiometer that sets the release time: Time that the compressor takes before returning to the "no gain reduction" state. 6 Gr High resolution gain reduction display: 16 LED's from -1dB to -22dB. 7 HPF Inserts a 80 Hz high-pass filter in the sidechain. Produces a Fat sound and eliminates bass driven pumping. 8 Dist Modifies the signal balance on the FET, adding second harmonic distortion. Close to the Rev A version of 1176. 9 Link Connects two compressors in stereo mode. 10 LED that shows the bypass status. 11 Off Compressor bypass button (hardware by relay). 1 Original Cinemag input transformer. 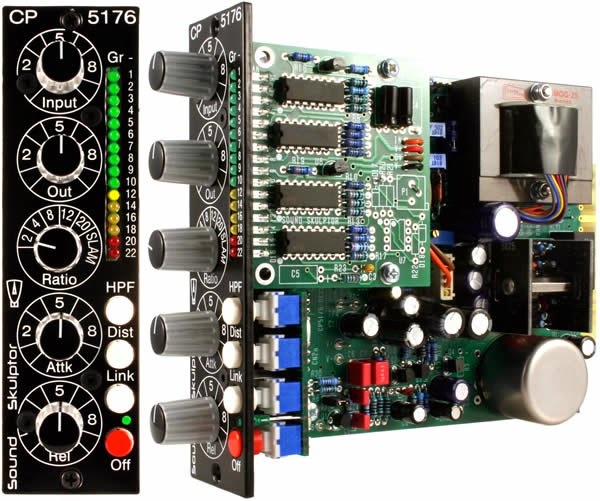 2 All discrete audio path with high grade components. 3 Discrete Op-Amp output circuit, pin compatible with API* 2520. 4 Original Cinemag output transformer. 5 Easy setup of 3 trimmers with a voltmeter, without iteration. 6 16 LED's gain reduction meter. Get complete info on the CP5176 including assembly guides on the website.